An all-new series featuring a contemporary take on one of the most revered and recognizable characters in science fiction history! When Tadashi Daiba’s father is murdered by invaders known as the Mazon, he becomes frustrated in the face of the Earth government’s flippant attitude. Landing himself in prison, Tadashi finds himself invited aboard the battleship Arcadia, controlled by none other than the legendary Captain Harlock. Joining his crew on their journey through space, Tadashi’s future will lead him to confront not only the Mazon, but the many other forces across the universe threatening humanity’s very existence. Leiji Matsumoto is one of Japan’s most influential manga creators. He is best known for Galaxy Express 999, Captain Harlock, and an animated collaboration with Western musical duo, Daft Punk. 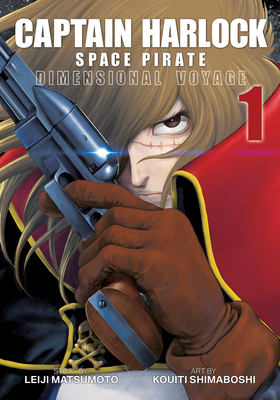 Kouichi Shimahoshi is a Japanese manga artist who made his debut on the highly-acclaimed remake of Captain Harlock. "Harlock leads the way to a world of new ideas."